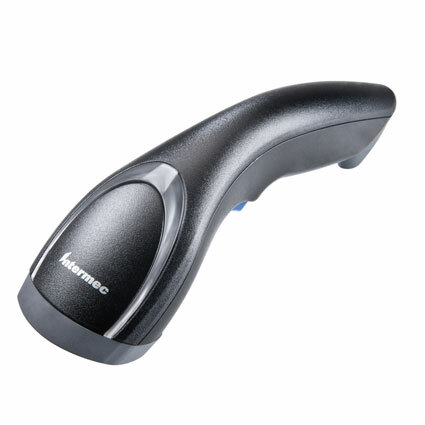 The Intermec SG20 barcode scanner provides any retailer with great 2D scanning in a unique form factor. Built with a lightweight and ergonomic body, the SG20 is ideally suited for medium volume retail or shipping/receiving applications. As a 2D imager, the SG20 can scan retail barcodes from about a foot away and with full omnidirectional capabilities, making the scanning process easier than ever. The barcode scanner reads 1D and 2D barcodes with ease, even in full daylight, increasing potential applications to outdoor scanning at garden centers or mobile vending. Dimensions (W x D x H): 2.4" x 7.9" x 2.6"
5.0 Mil 2" to 5"
20 Mil 2" to 18"
40 Mil 5.5" to 27.5"
10 Mil PDF417 2" to 9.9"
15 Mil PDF417 2" to 14"